This morning I sat down to write a new blog post. Wrote the entire thing and was getting ready to post it to my blog when I noticed from my admin panel a similarly titled blog post. 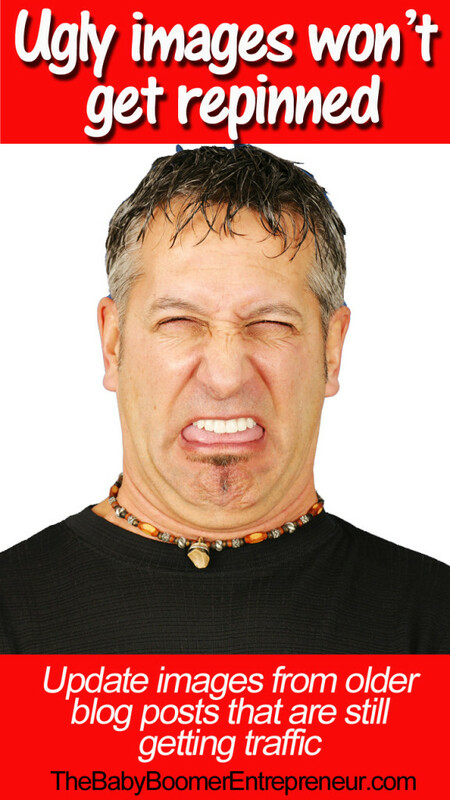 Deciding I better check, I discovered a large portion of that post was telling the same story I just told. Not only am I repeating myself to my son and husband, I’m now doing it to you. Needless to say, I decided to come up with something new. Here’s my new attempt. 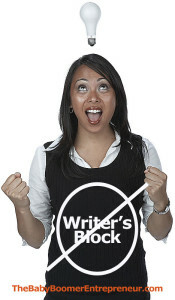 How do you decide what to write about on a blog or post to Facebook/Google+/Twitter etc? Next to my desk I have a small white board (actually it’s silver but I digress). When I come up with topic ideas I jot them down so I’m never out of topics. I can look at one of my social networks and see if there’s a trending hashtag or theme that’s being talked about. Then I need to consider if I have something worthwhile to add to the conversation. If I’m just going to be creating a “me too” post what’s the point? But if I have a different opinion or something deeper to add to the conversation then I should start writing. If I’m launching a new product or service, writing about related topics can help with search engine optimization. I can also “prime the pump” by getting my audience to think about this topic. Then when I’m ready to promote I’ve hopefully got an audience who will be interested in my offer. Blog posts or lately podcasts are often a source of inspiration for me. When I hear an interesting idea or a new take on an old theme that will often send me off on a tangent that can lead to a great blog post. When I read a business book I often keep some post-it notes handy for flagging interesting bits. I can later go back and use them as a quote to start a new topic. Often called news-jacking, this involves using a current news story to help promote yourself. A famous example is Tide during the Super Bowl. 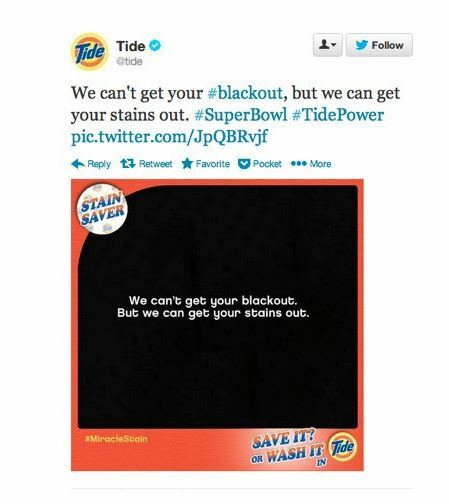 When the lights went out some quick-witted person at Tide tweeted. This post got retweeted, favourite and written about, giving Tide tons of free publicity. A word of caution: don’t be sleazy when doing this. A recent edition of the UnPodcast talked about someone using the missing Malaysian airline to promote her marketing services. The angle went something like “are you missing in action, like the airline? I can help you get found”. Talk about bad taste. Many times the best blog posts or social media updates come from my own life. Maybe it’s a mistake I made or a lesson I learned the hard way. It might be something I’ve been struggling with myself and I write about it because you might have the same difficulties. Sometimes I want to learn something new and I’ll interview experts in the field “for my blog”. This is a cool way to find out what your people are interested in. Just type in “favourite interests of people who like X”, X being your Facebook page name. You’ll see what else your audience is interested in. Here are some of the ways I come up with ideas. If you have any other suggestions, please leave a comment and share. Clearly I need some additional inspiration! Blogging and article writing are wonderful marketing tools, particularly for people who are selling their expertise and not a product. It’s a great way to showcase your knowledge. They are also fabulous for SEO (search engine optimization). If you’re blogging regularly, you have new content for Google to index. By automating sharing your posts with your social media profiles, you can really expand your reach. And if you’re content is great, other people will help spread the word by sharing what you write. But what happens when the well runs dry? What do you do when you run out of ideas? Doesn’t matter what your business, you have certain questions that you answer over and over again. Whether it’s from a new client, a prospect or someone you meet at a networking event, people want to know certain things about what you do and how you do it. Each of those “frequently asked questions” can and should become a blog post. If you write the answers well, and perhaps include them in an FAQ section on your website, you may find prospects have fewer questions when they talk to you. Just like this article, having a post called “X ways to do Y” almost writes itself. And people love “how-to” articles. They’re quick to read and often useful. No, I don’t mean plagiarize them. But by reading other blogs in your industry, you will get ideas. Sometimes you might strongly disagree with the writer. Or you might agree with them but want to go deeper into the topic. In that case, refer to the original article with a link, and then write your own thoughts. It will add interest and authority to your own blog – people will see you’re not just making it all up. Additionally, you may get traffic from the original blog. If they like what they wrote, they may share a link to your article. I use Google Reader to subscribe to blogs. Then I use the Feedly plugin for my web browers to peruse the blogs I subscribe to. I use Feedly because it makes things look “pretty” so it’s more fun reading article using it. Are there tools you use that your audience might find useful? For example, I have written a number of articles about various tools for automating posts to social media or plugins for a WordPress blog. You could create a list of your favourite blogs or podcasts from your industry. Include the name of the resource, a paragraph about why you like this resource and where your readers can get the resource. Do you have a stack of books related to your field sitting in your office? Read one of them and write a review of the book. Post to Facebook or LinkedIn, asking what people want to know about your industry. You may get enough topics to keep you going for months. Sometimes things going on in your own life will resonate with your readers. Are you getting married, expecting a child, going to a graduation or winning an award. Share it. It allows your reader to get to know you as a person, not just the business. Post a white board next to your desk or keep a notepad on it. Get in the habit of recording your blog post ideas on it. At first you won’t have many ideas on the board, but when you get used to writing them down as they occur, you’ll find you’ll never run out of ideas again. Do you blog as a marketing tool? Leave a comment and share a link to your blog or share one of your tips for keeping the ideas coming. If you have a WordPress blog, you know that plug-ins add functions to your site that really allow you to customize the blog to what you want it to do. Here are some of my favourite plug-ins.